The Wild Horse Dirt Fondo is set for April 30, 2016 in the Cedar Mountains, west of Grantsville, Utah. Photo by Chris Magerl. 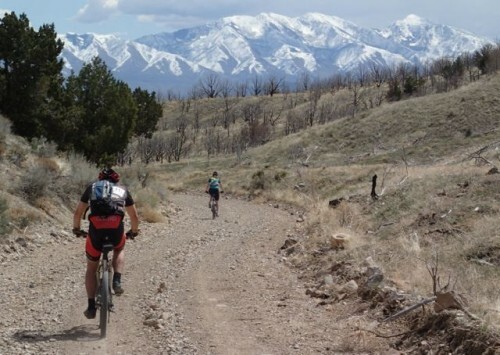 April 26, 2016 – The Wild Horse Dirt Fondo, a 31 or 76 mile dirt road ride in the Cedar Mountains near Grantsville, Utah, is slated to run on Saturday, April 30, 2016. Organizer Chris Magerl sent Cycling West an update regarding the course, registration, and weather contingencies. The Wild Horse, a dirt fondo in the Cedar Mountain Wilderness, less than one hour west of Salt Lake City, is this Saturday! Choose the big loop of 76 miles or go easy on the 31 mile Little Wild Horse. All on unpaved county-maintained 2WD dirt and gravel roads. The ride benefits the Utah League High School MTB Scholarship Fund. There is the possibility of a rain-induced schedule change. Rain and mud are not trivial elements in the Cedars. It can produce a situation that limits the possibility of safe travel for emergency vehicles. Safety of riders and volunteers is the top priority.